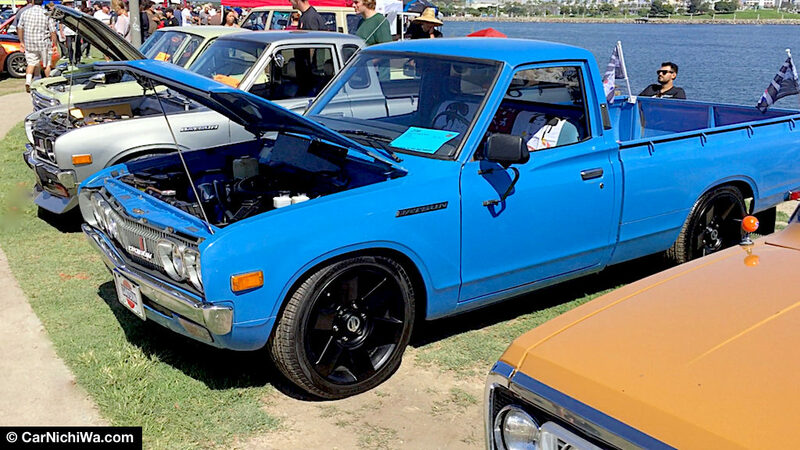 One of our favorite vintage car shows in the greater Los Angeles area is the annual Japanese Classic Car Show (JCCS). Dedicated to vintage “old-school” Japanese brand cars and trucks, the show attracts hundreds of entries and thousands of fans. 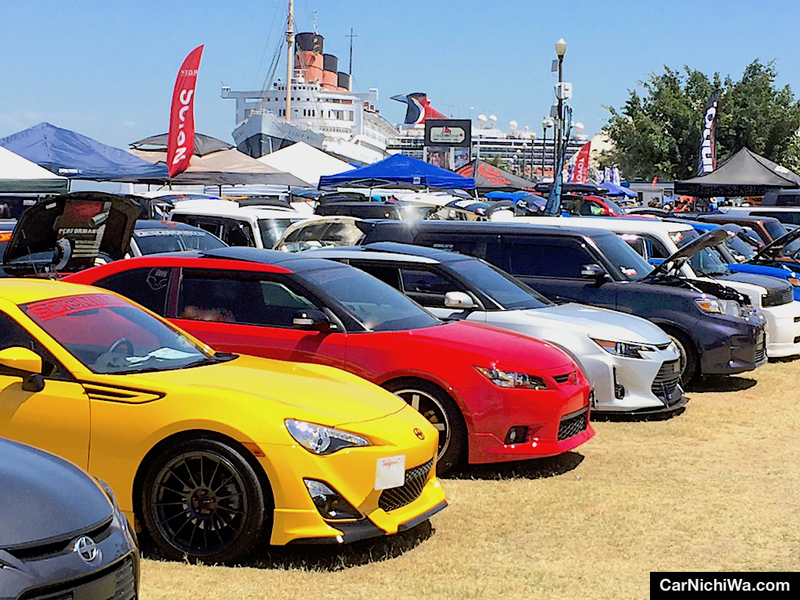 We attended the 13th annual show on Sept. 23 at the scenic Harry Bridges Memorial Park adjacent to the Queen Mary in Long Beach. The combination of a beautiful park, magnificent vistas of skyscrapers across the bay and watercraft passing by provides a majestic backdrop for this event. 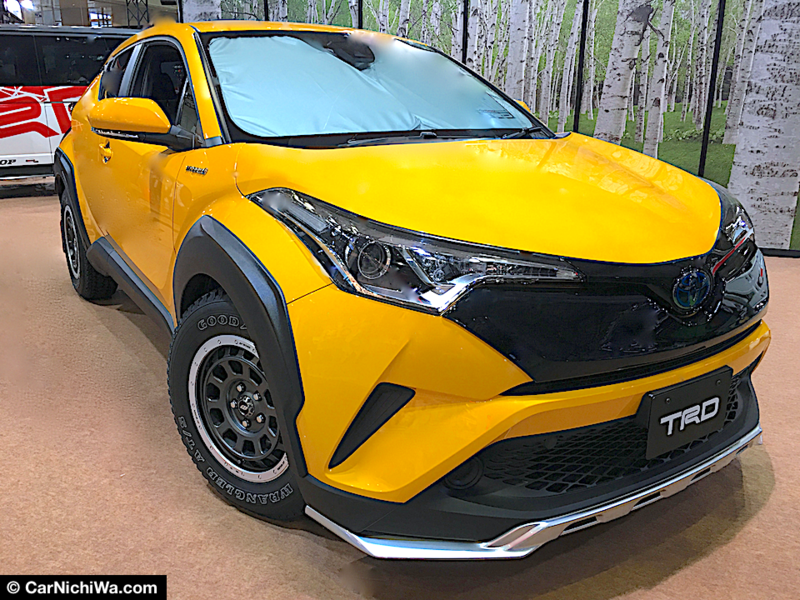 At this year’s show, Nissan, Toyota, Honda and Mazda sponsored displays that celebrated some significant milestones. 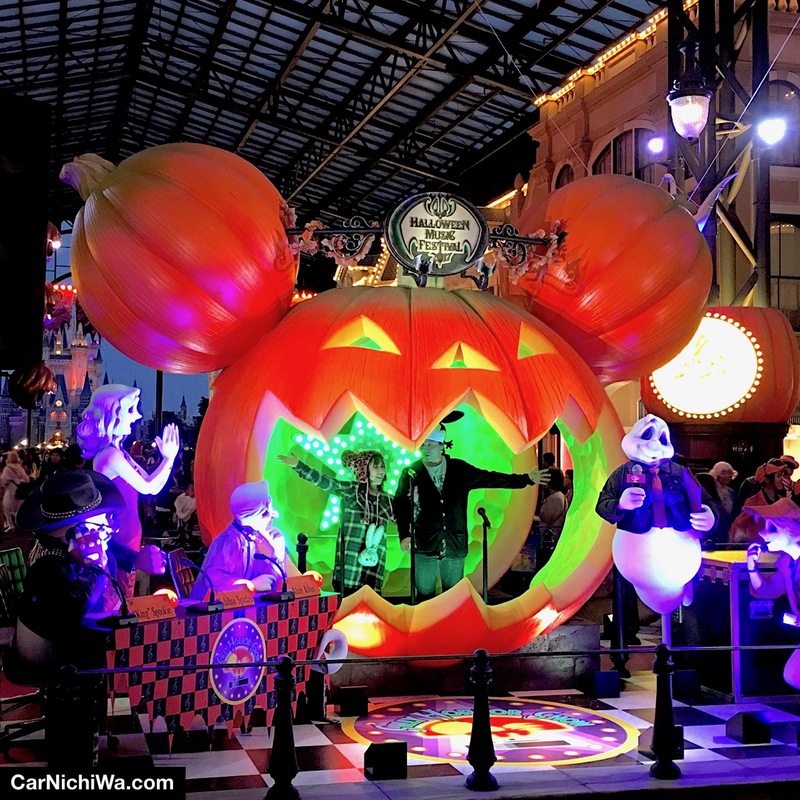 Our review includes two dozen videos that you can watch here or on our CarNichiWa.com YouTube channel. While Nissan’s display honored the 50th anniversary of the 510, it also offered a sneak preview of the new 2018 Leaf slated to go on sale early next year. Leaf gains all-new styling plus increased driving range of up to 150 miles. Nissan also plans a higher-power version with increased motor and battery capacity for 2019. Three historic EVs joining the Leaf included the 1999 Hypermini EV (above), 2002 Altra EV, and 2011 Pikes Peak Leaf, the winner of the first Pikes Peak Electric Production Class. 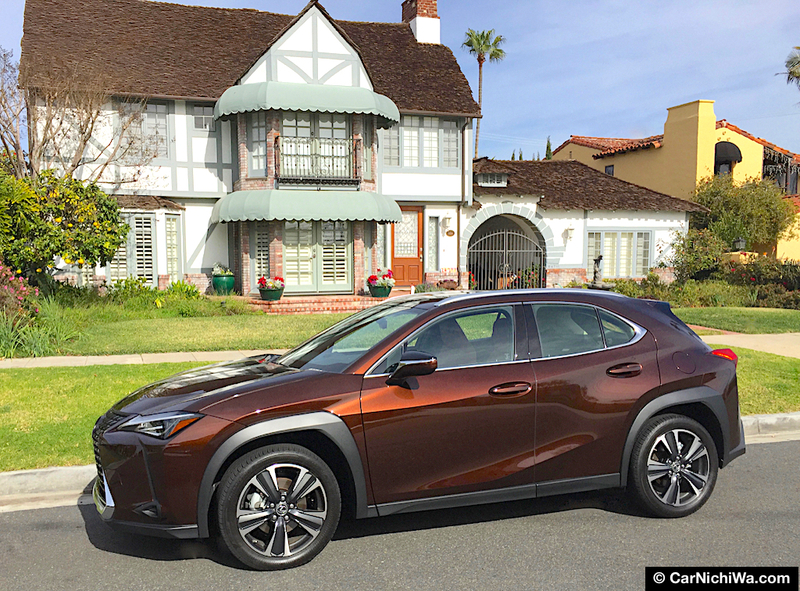 Nissan made 219 Hyperminis with only 26 coming to the U.S. Fifteen were used for trails at UC Davis and 11 by the city of Pasadena. 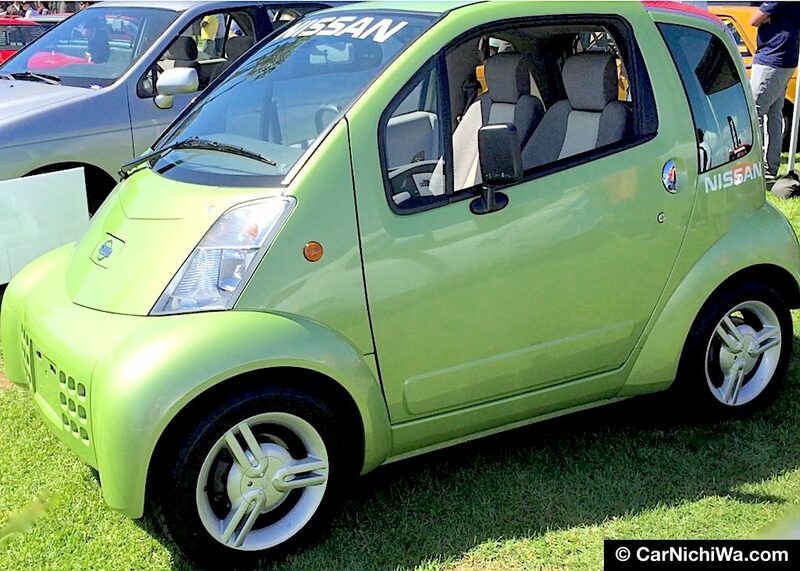 With lithium-ion batteries, Hypermini’s range was about 71 miles. Launched in October 1967 as a 1968 model, the 510 went on to sell more than 300,000 units. Nissan displayed a 1972 510 original “4-door sports car” from its heritage collection. 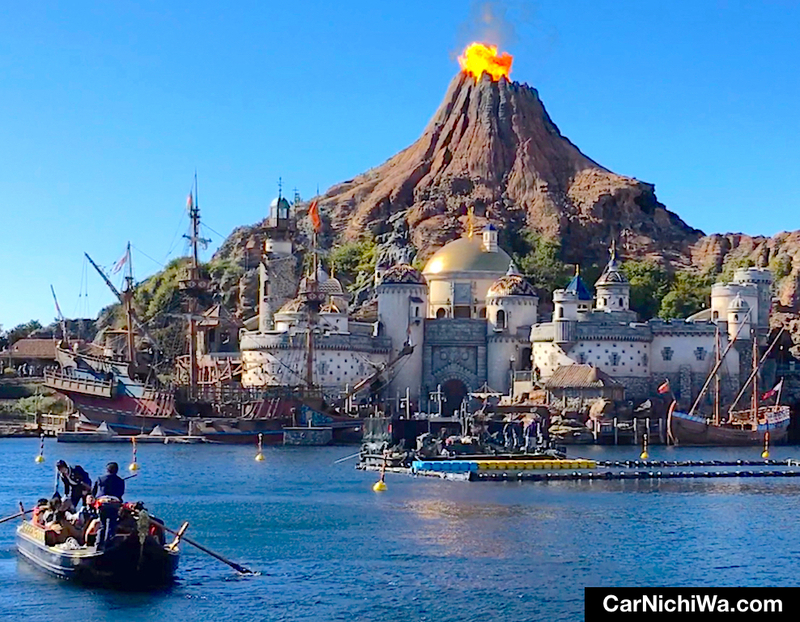 As the story goes, Yutaka Katayama, the legendary “Mr. K” of Datsun 240 fame, challenged Nissan engineers in Japan to create an everyday driver with European style and power for U.S. highways. 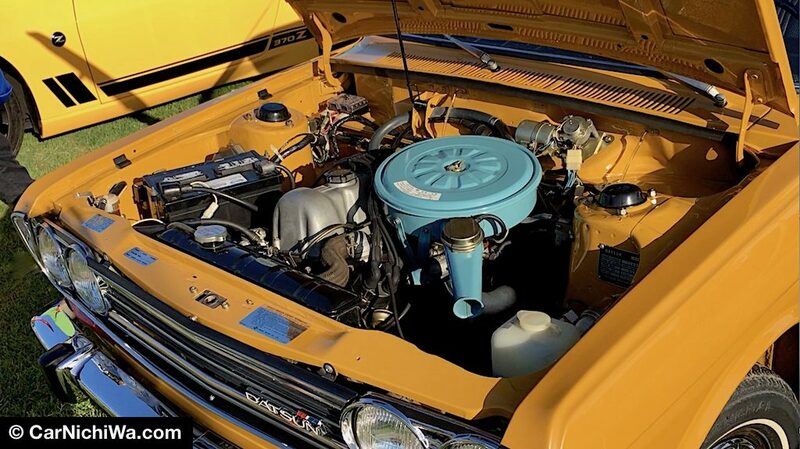 The rear-drive 510 was powered by a 1.6-liter 4-cylinder engine that put out 93 horsepower connected to a 4-speed manual gearbox or 3-speed automatic. As a collector car, the 510 remains an affordable classic that’s easy to modify. With production spanning more than 45 years, the Nissan (formerly Datsun) Z sports car offers an array of choices for collectors. The original 240Z remains a highly prized collectible as does its counterpart, the right-hand-drive Japanese market Fairlady Z. The yellow model sporting “240 Z1” license plates in our above video was originally owned by Mr. K.
Talk about a Hardbody, this 1994 Nissan D21 raced at El Mirage and Bonneville. 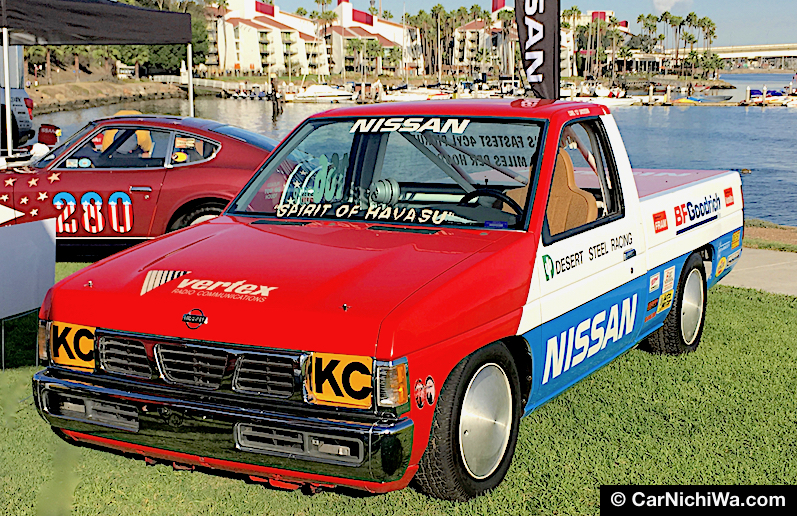 Nissan says it set records in the mid-1990s for a 4-cylinder truck including a class-record run of 142.9 mph on the Bonneville Salt Flats. While Nissan didn’t officially import the Skyline to the U.S., its popularity here continues to grow thanks to exposure in movies, video games and car shows like JCCS. Skyline was offered in several bodystyles with different stages of tune and performance options, including the legendary GTR. On the spec sheet for this modified 1972 Skyline 2000 GT-X, the owner says it wears GTR-R style front and rear over fenders along with other mods including custom front and rear coil-over setup, front brake calipers and aluminum rear drums. 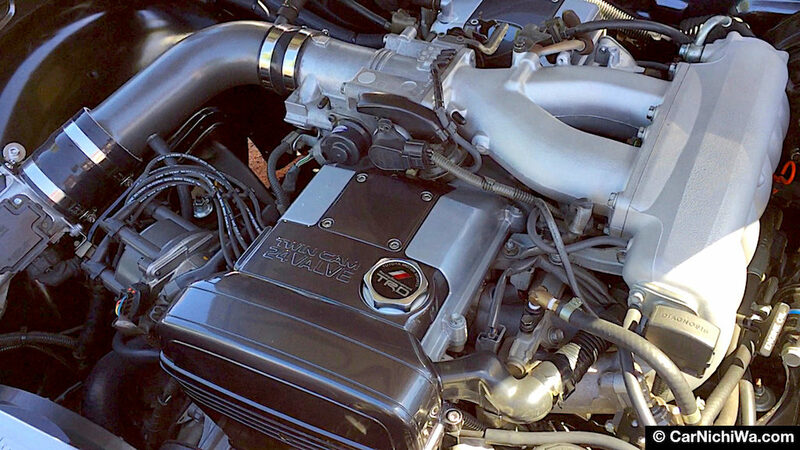 This feast for the eyes is the ’72’s modified R34 RB25 engine with custom individual throttle bodies, stainless header and twin-pipe exhaust. We also like the attention to detail including hidden wiring. Power is transferred to the rear wheels via an RB25 5-speed gearbox with a performance clutch and flywheel. 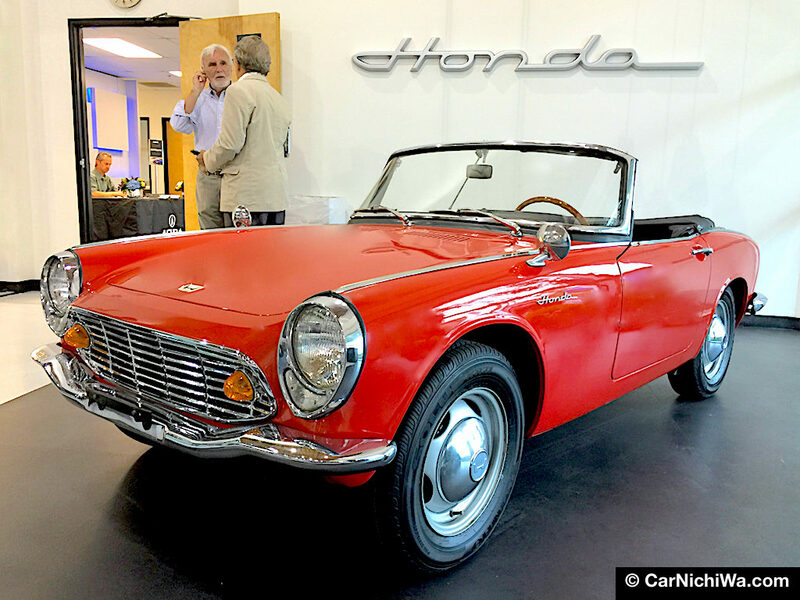 Datsun enthusiasts, restorers and collectors brought out their prized 510s to help celebrate the major milestone at JCCS. We captured several in our video along with an array of good-looking 510 wagons. We didn’t recognize this car at first, yet closer inspection revealed the greenhouse (glass area) and doors of a Nissan 240SX (called Silvia in Japan). This highly modified 1996 model features a body kit with big fender flares, and an SR20DET engine with performance exhaust, wastegate, clutch and flywheel. This 1991 Nissan Figaro was one of a quartet of retro-inspired cars built by the automaker and not officially imported to the U.S. Riding on a March-Micra platform, it sports Euro-inspired styling plus a retractable center roof section. Toyota’s sponsored display at JCCS this year included some rare gems like this 1975 Celica. We remember watching this Celica pace the race at the Long Beach Grand Prix in the 1970s, which was later renamed the Toyota Grand Prix of Long Beach. 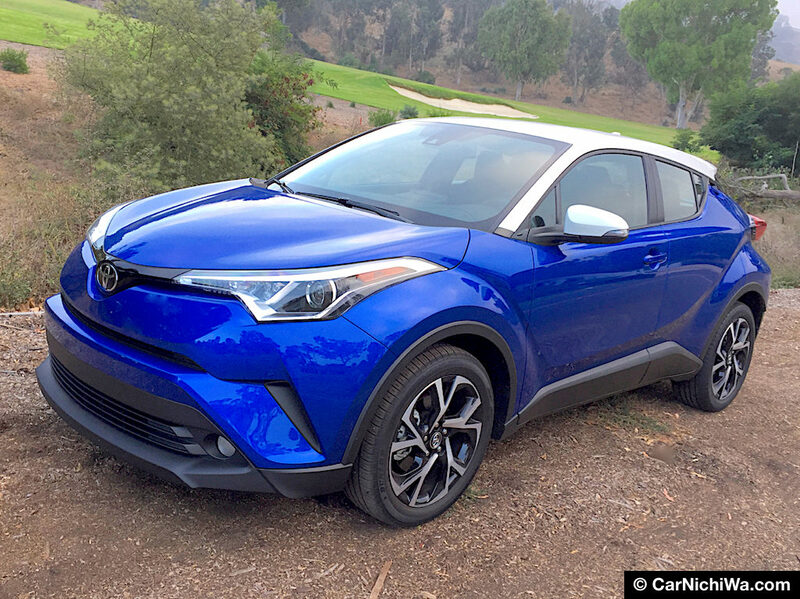 Sixty years since the first Toyotas arrived on a boat at the Port of Los Angeles, the automaker’s nearby headquarters is relocating from Torrance to Texas. 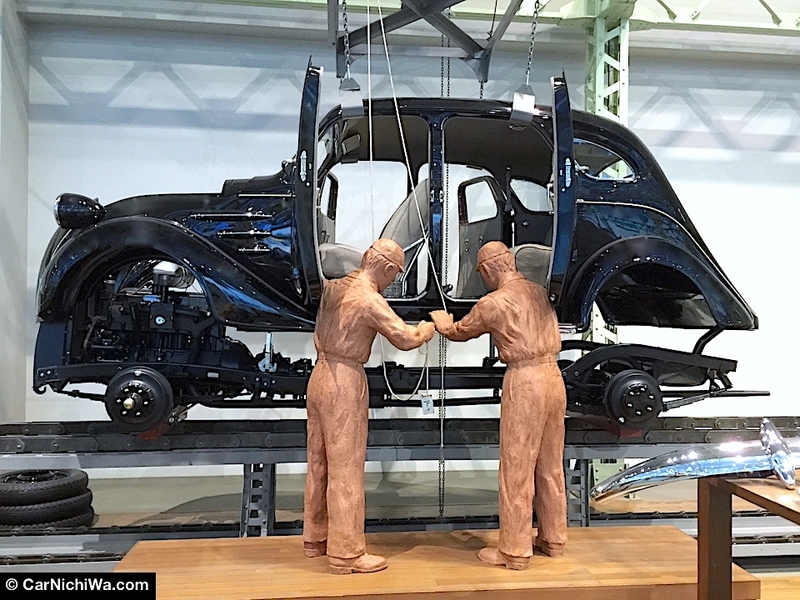 The Toyota USA Automobile Museum is also closing its doors and moving its collection. 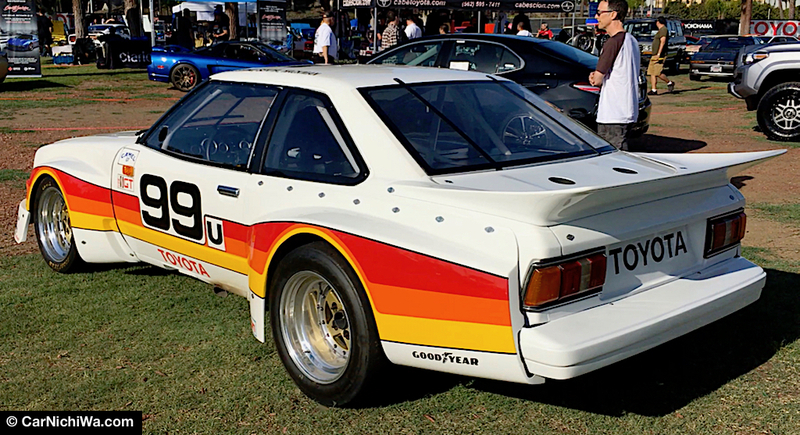 Southern California is filled with Toyota fans so we expect to see more rare cars like this Celica racer at future shows. 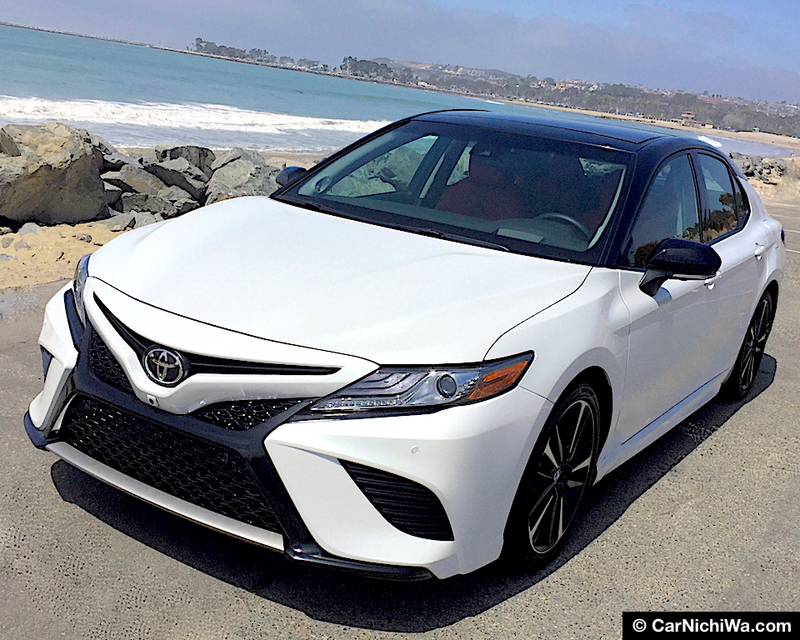 Corolla recently celebrated its 50th birthday, while more than 44 million have been sold across the globe. 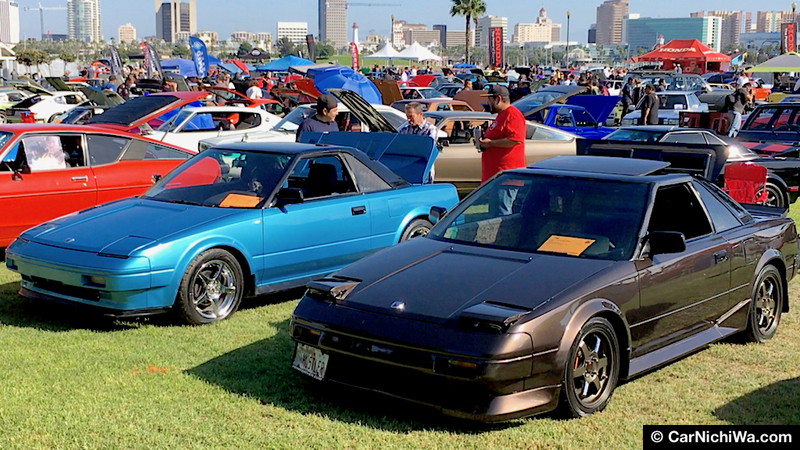 Some of the most popular Corolla collector cars at this year’s show included the AE86, also known as hachiroku. Long before the term “crossover” became fashionable, we remember a time when cars like this 1983 Tercel SR5 4×4 wagon were a common sight on the street. Today, it’s rare to find one in pristine condition like this model on display at the Toyota exhibit. 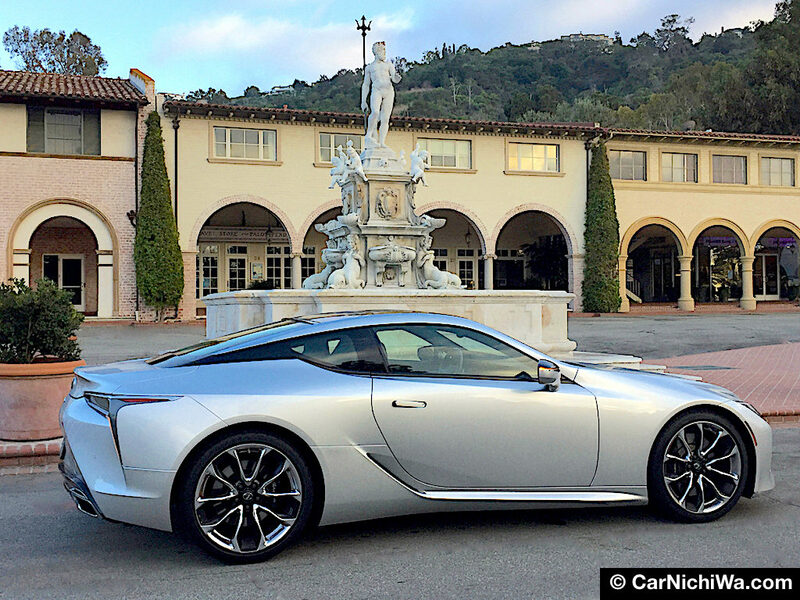 Toyota’s sporty Supra may be out of production, yet it remains extremely popular with collectors. 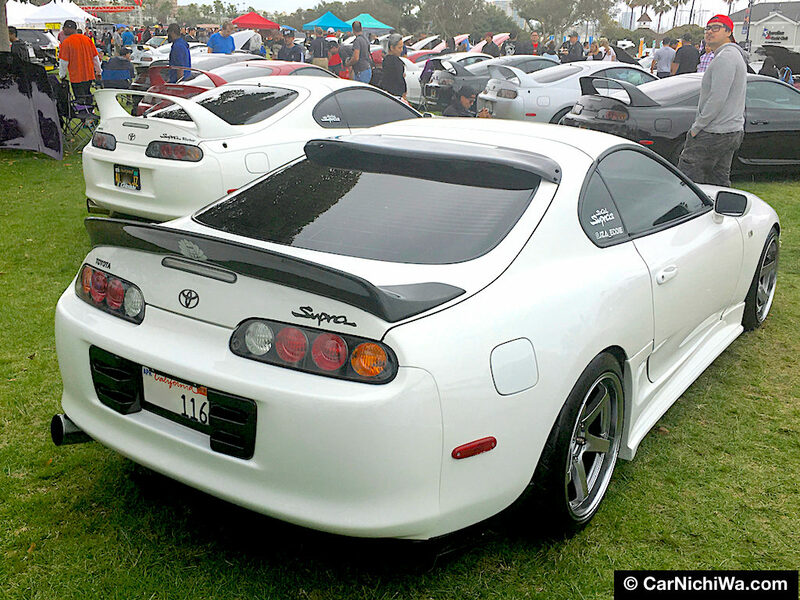 From the first long-nose Celica Supras to the last models with turbocharged engines, there’s something for everyone in the Supra lineup. This gorgeous 1970 Toyota Crown has been given the pro touring treatment by its owners Janet Fujimoto and Dwayne Tomono. Starting with the body shell, many components were custom-built and fabricated to give it a classy modern appearance. 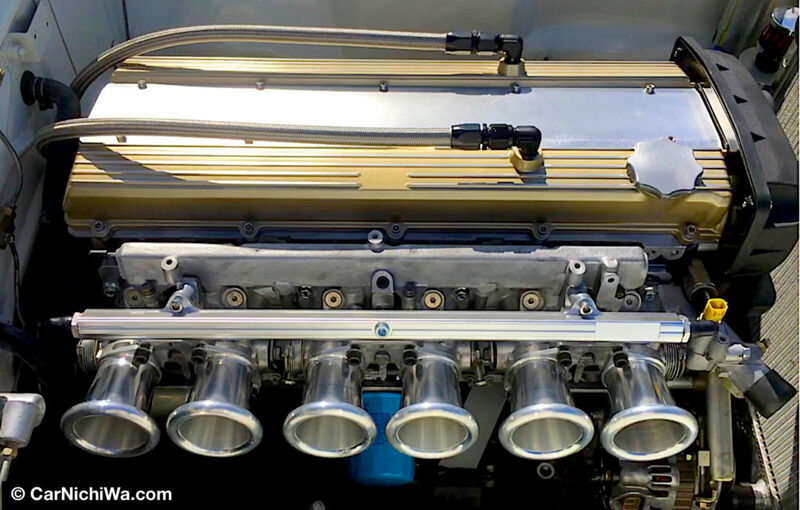 This work of art under the hood is a 2JZ-GE engine installed with custom motor mounts. 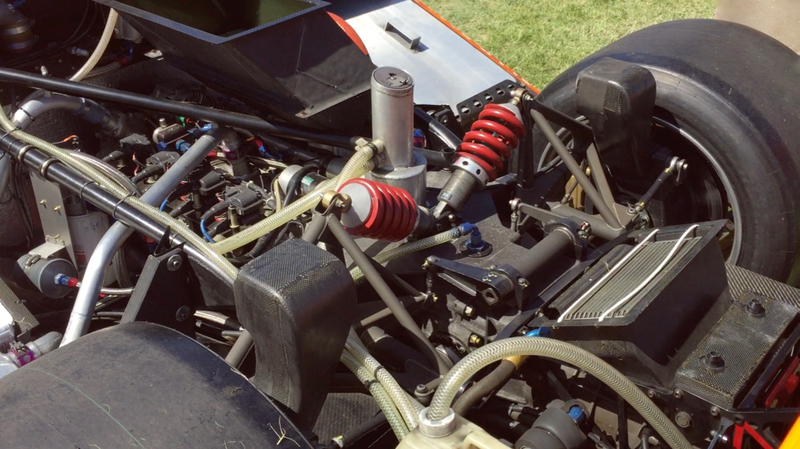 Power is transferred to the rear wheels via a custom driveshaft. Inside, the Crown’s original seats have been reupholstered while a custom billet aluminum dash includes updated gauges. 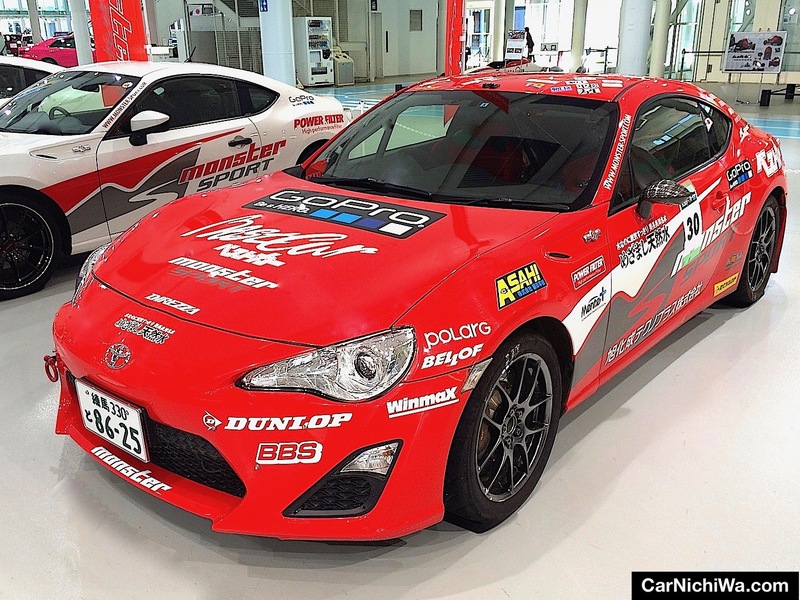 Positioned between the Corolla and Supra, the Celica is very popular with collectors today. Models like this Sunchaser convertible conversion are getting difficult to find. 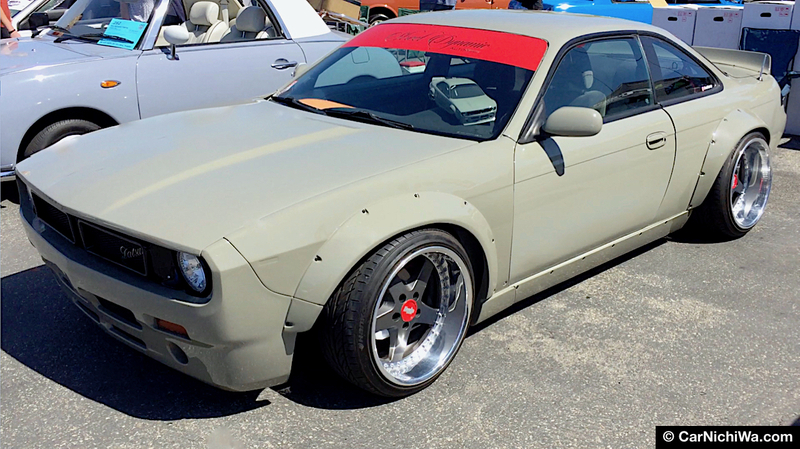 We’ve captured some of the other super clean Celica models at the show in our above video. From its humble beginnings 60 years ago, the Land Cruiser helped Toyota become a household name in America. This 1971 FJ40 with its 3.9-liter 6-cylinder engine was sold new in Phoenix and is said to be in unrestored condition. 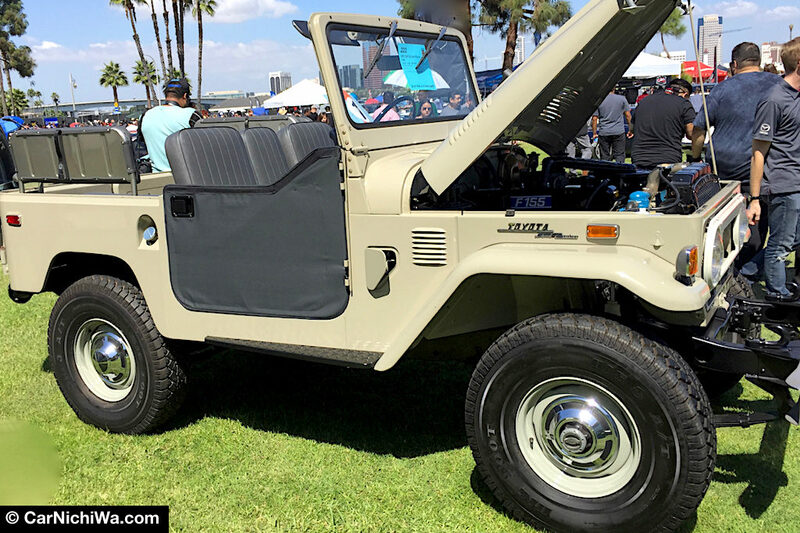 This 40 Series short-wheelbase Land Cruiser convertible is incredibly clean inside and out. 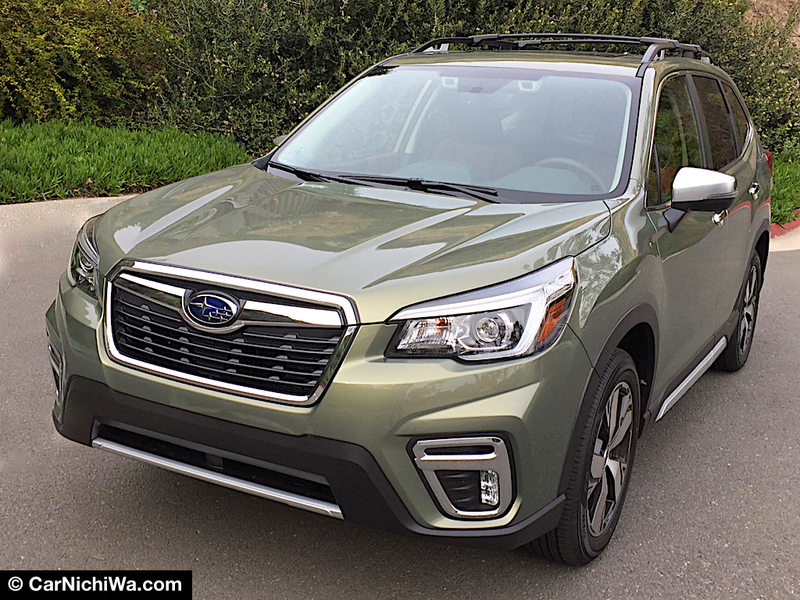 We liked the soft half-doors that offer some protection from the elements while maintaining a wide-open feeling. With two-door, four-door wagon and pickup bodystyles, Land Cruiser covers all the bases for collectors. 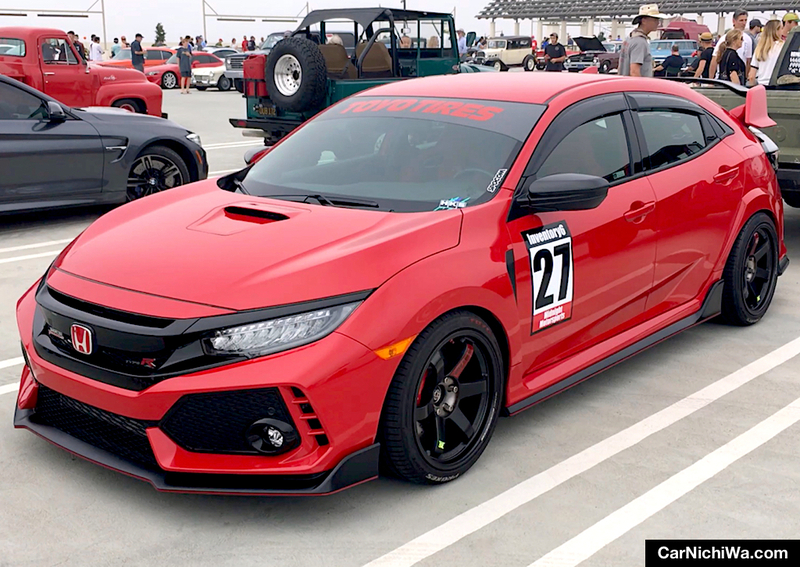 Honda’s company display at JCCS featured cars and bikes from its past and models destined to become collectible in the future like this new Civic Type R. Take a look at the Honda display in our above video. 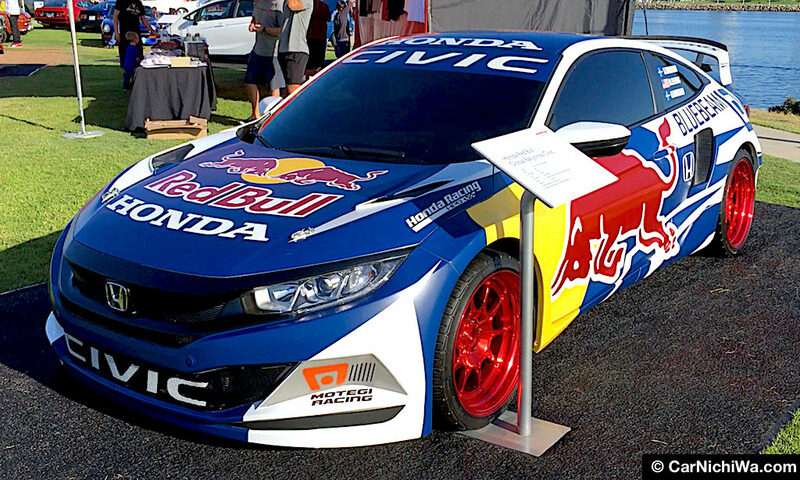 This Honda Red Bull Global Rallycross Civic is fitted with a custom 2.0-liter turbocharged engine that puts out an amazing 600 horsepower and 630 lb.-ft. of torque. The spec sheet quotes a blistering fast 0-60 mph sprint of just 1.9 seconds. 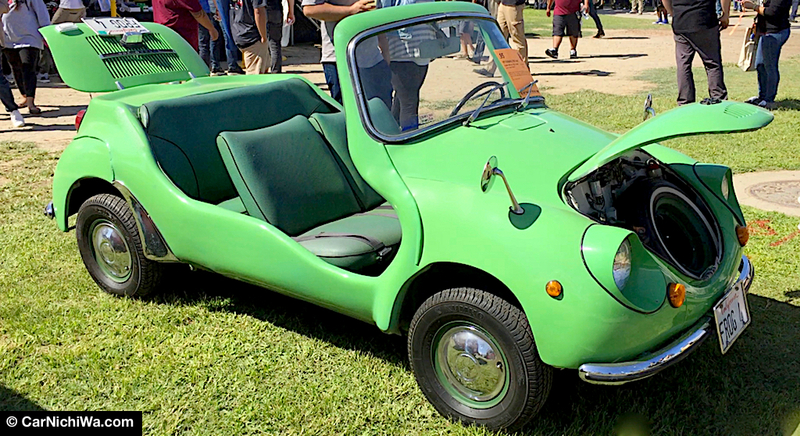 This super rare and rarely seen 1965 Honda T500 truck was a joy to behold. Equipped with right-hand-drive, folding side bed and wearing a Japanese number plate, it appears to be in well-preserved original condition. Its predecessor, the T360, introduced two years earlier, is known as Honda’s first production truck. 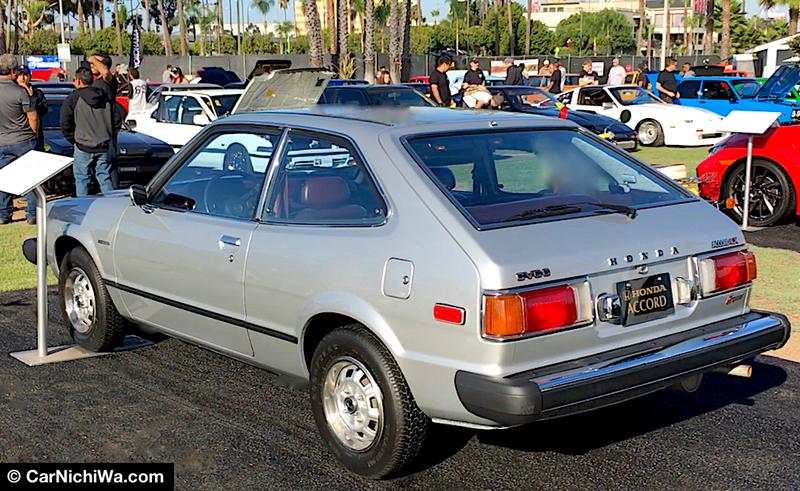 This bone-stock 1979 Accord Hatchback from the first generation was on display from the American Honda Museum. 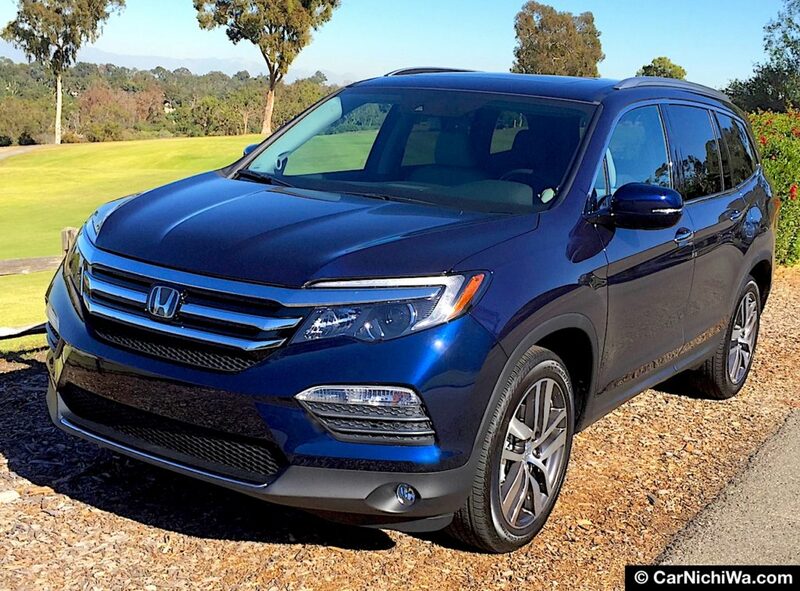 It’s amazing to note how far the Accord has come from the first hatchback models to today’s super sophisticated sedans. 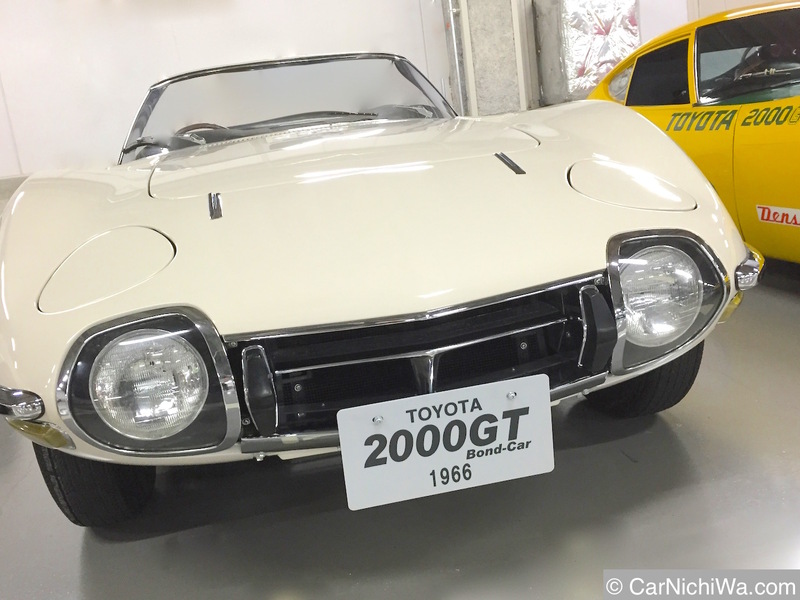 This Honda Z600 is the sporty “coupe” version of the N600, Honda’s first car model line sold in the states. Highly collectible today, Honda sold just 15,000 Z600 models during its brief two-year run. Under the hood is a 2-cylinder, 600cc air-cooled engine shared with the N600. 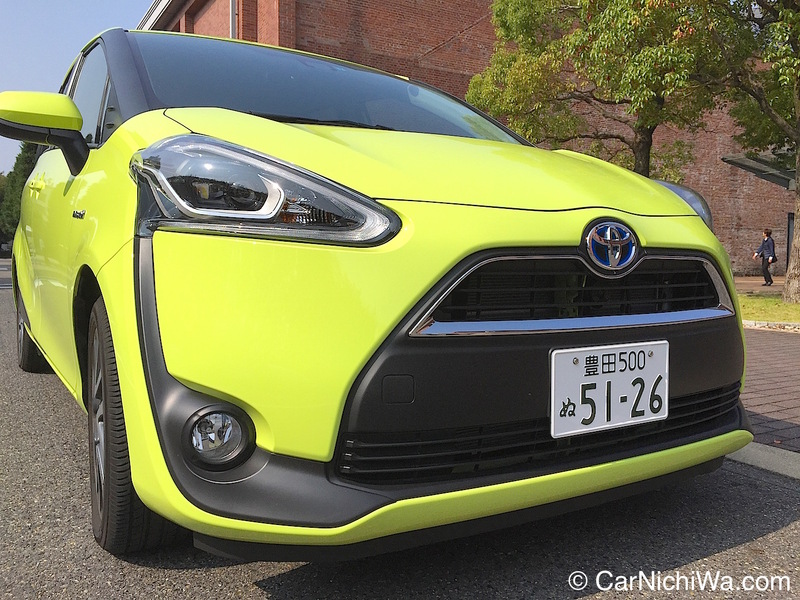 While it seems remarkably small by today’s standards, Honda continues to offer a variety of modern N-Series cars and vans in the “Kei car” mini-vehicle class in Japan where engine size is limited to 660cc. 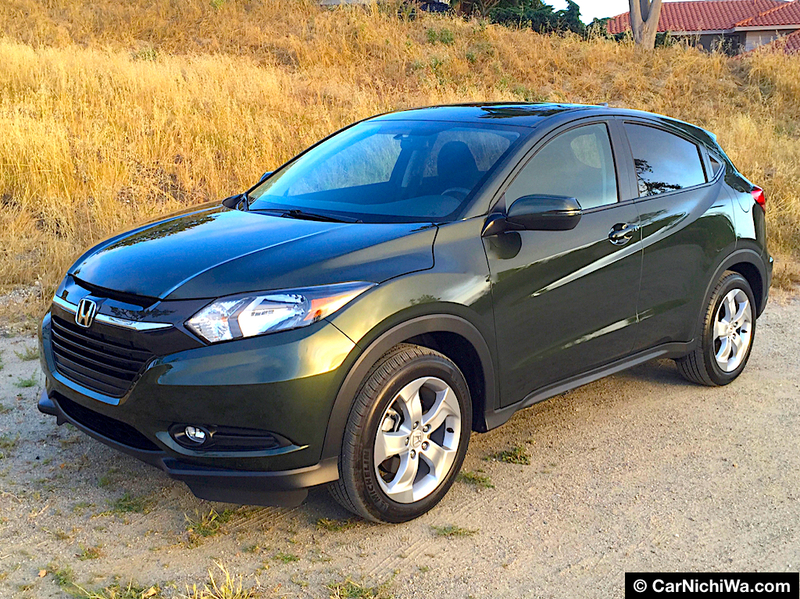 The popular Honda CRX is light, agile and easy to modify. 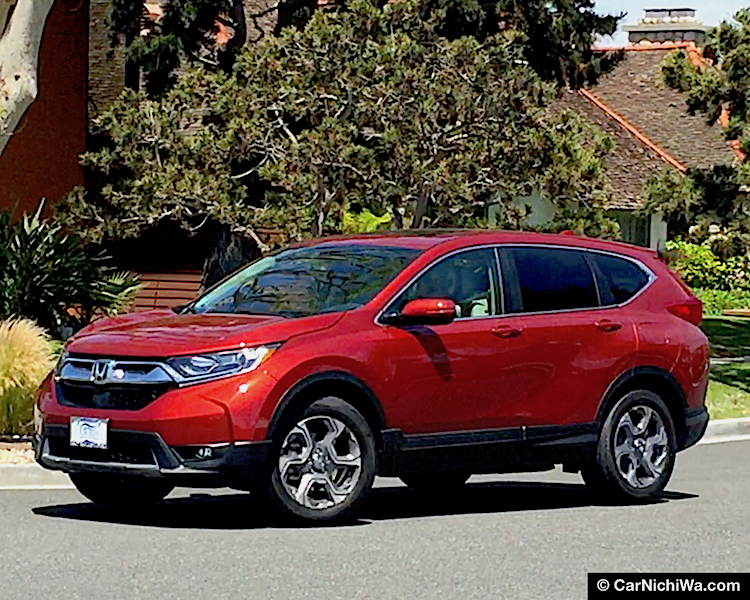 We captured several CRX models on display by their owners at this year’s JCCS in this video. 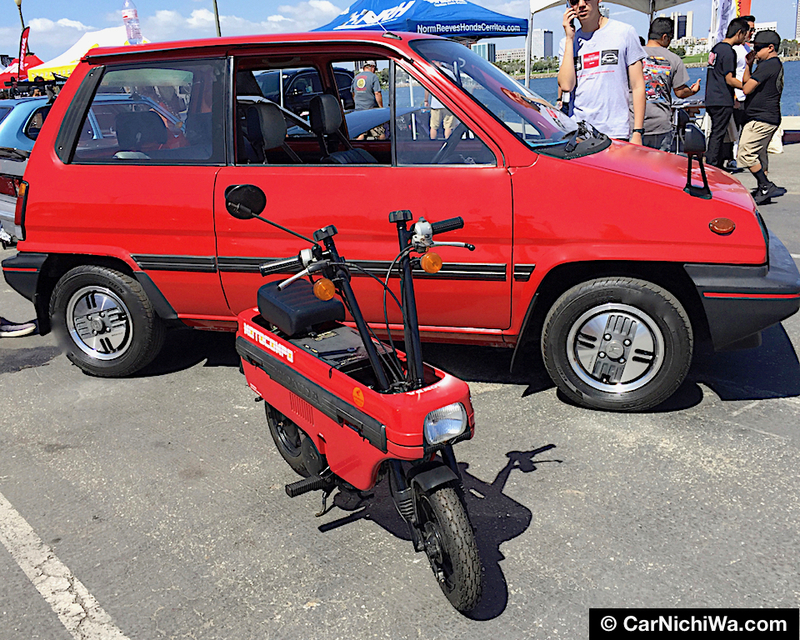 We’re not sure which one is cooler: the red Honda City R (above) or the Motocompo bike that folds up and stores in the City’s cargo compartment. Be sure to see the other Motocompo micro-bikes in our separate motorcycle video at the end of this story. 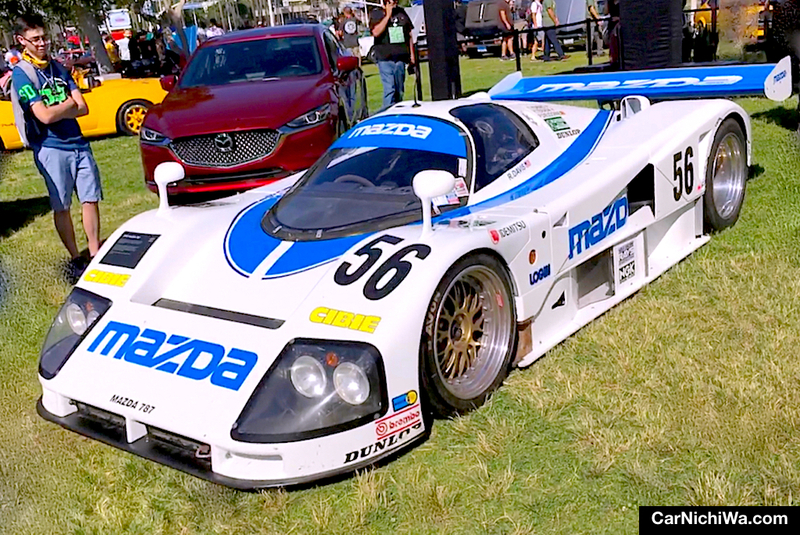 In this video, we take a walk around Mazda’s display that featured a tribute to the rotary engine with cars like the 767B Le Mans prototype, rare Cosmo Sport models, three generations of the RX-7 and an RX-3 SP racing car. 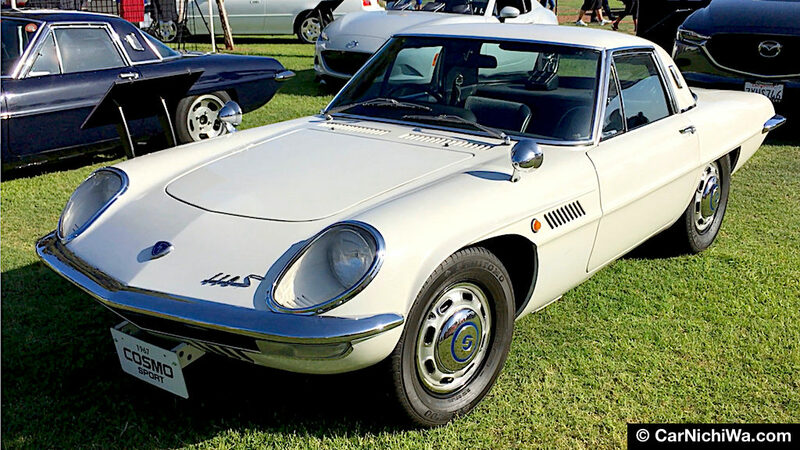 This Cosmo Sport 110S owned by Mazda was on hand to help celebrate 50 years of the rotary engine from the automaker. After debuting at the 1964 Tokyo Motor Show, the Mazda Cosmo Sport 110S went on sale in Japan on May 30, 1967. As the world’s first production twin-rotor, rotary-engined car, just 1,176 Cosmo Sports were built. Beautiful examples of Mazda’s RX-7 from the automaker and privately owned models from enthusiasts were on hand at this year’s JCCS. We take a closer look at these rotary sports cars in our video. The third generation RX-7 was fitted with a twin-turbocharged version of the 13B rotary engine. 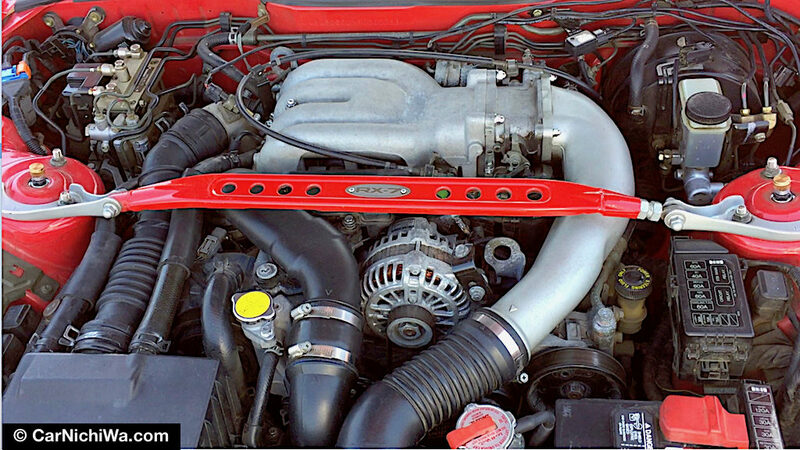 The owner of this bright red car must have spent countless hours detailing the spotless engine compartment. 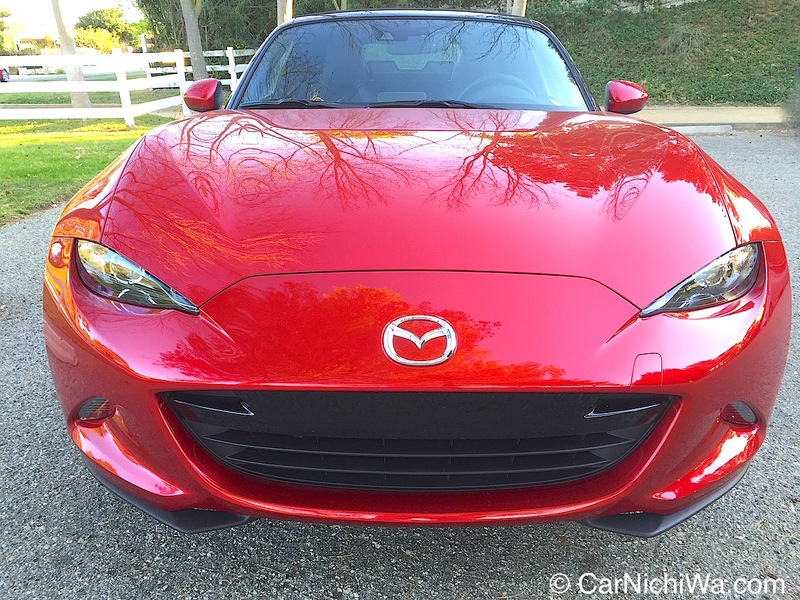 A gathering of collectible Mazdas wouldn’t be complete without the MX-5 Miata. 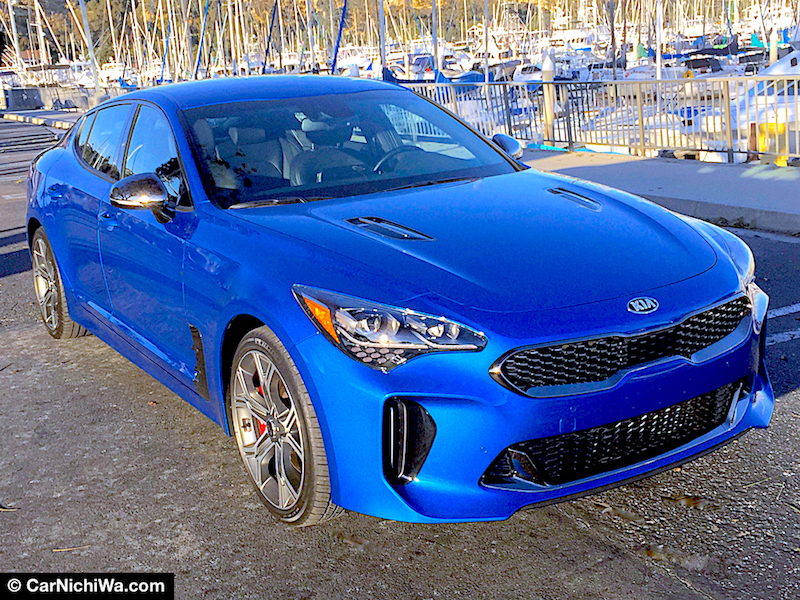 Owners brought out nicely restored and modified cars while Mazda showed its latest spin on the successful sports car formula called the Miata RF. 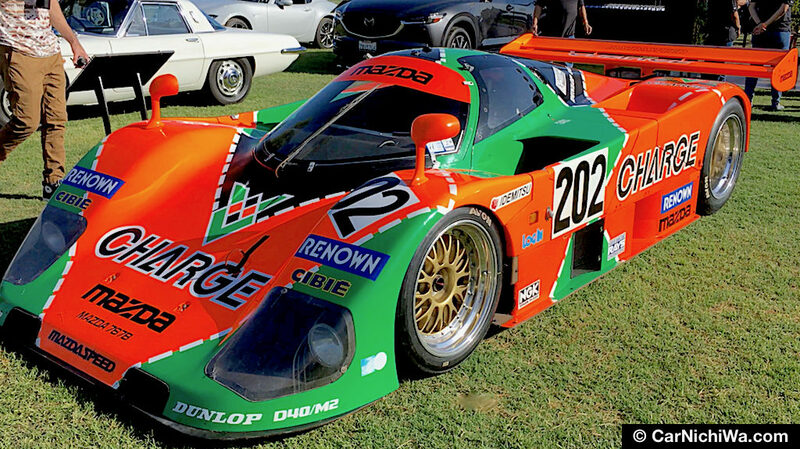 The highest point of Mazda’s development of the rotary engine was in 1991, when the quad-rotor-powered 787B won the famed 24 Hours of Le Mans. The 1989 767B Group C Prototype (above) was at Le Mans earlier, finishing ninth overall, completing 365 laps. It also won two GTP class victories in the All Japan Sports Prototype Championship. We took another look at the 787B later in the day and discovered that the rear body panels had been removed to show the powertrain. The four-rotor 13J put out a stout 630 horsepower. Owned by Mazda North America, this 787B is part of the Mazda Heritage Collection. We remember a time in the 1970s when Mazda offered rotary engines in a wide variety of models and body styles. 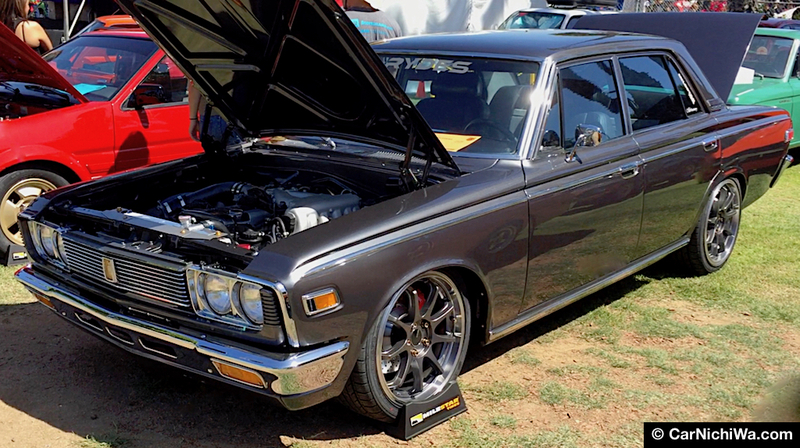 This video highlights Mazda RX-3 models at this year’s show including those modified for racing. 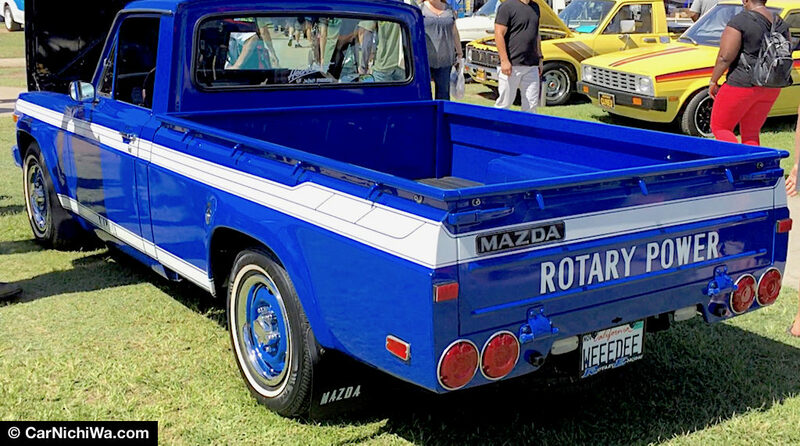 We were glad to see several Mazda rotary engine pickups on display by their proud owners. 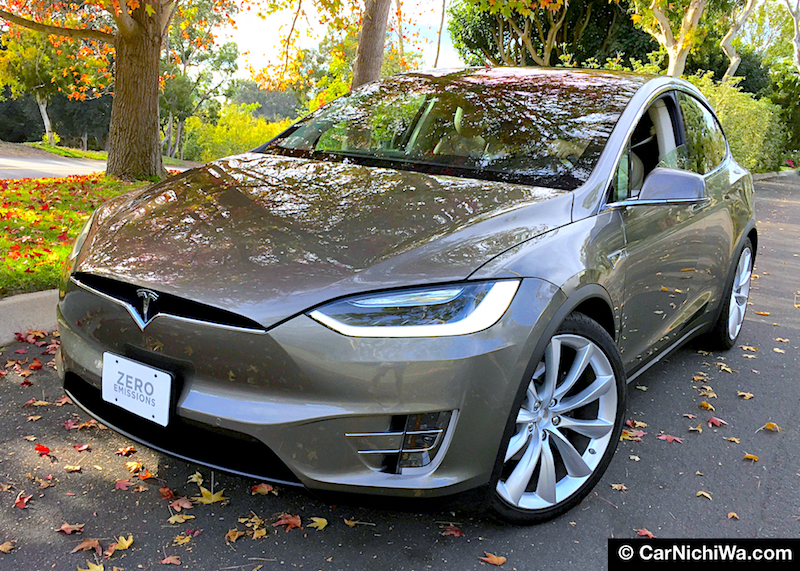 This super-clean example also sported California license plates that made us smile. Remember the Subaru Brat? 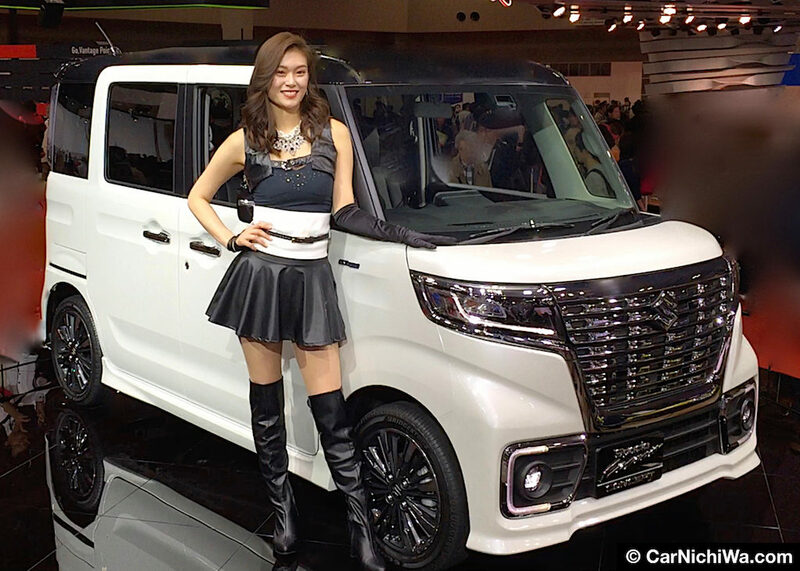 This car-based pickup featured a pair of seats in the cargo area (to avoid the tariff on imported pickups). Our video also highlights other compact trucks on display at JCCS. Whether it’s for work or play, Datsun, Toyota and Mazda mini-trucks are fun to drive and restore. Some of our high school friends owned trucks like the Datsun “Lil Hustler” when they were new. 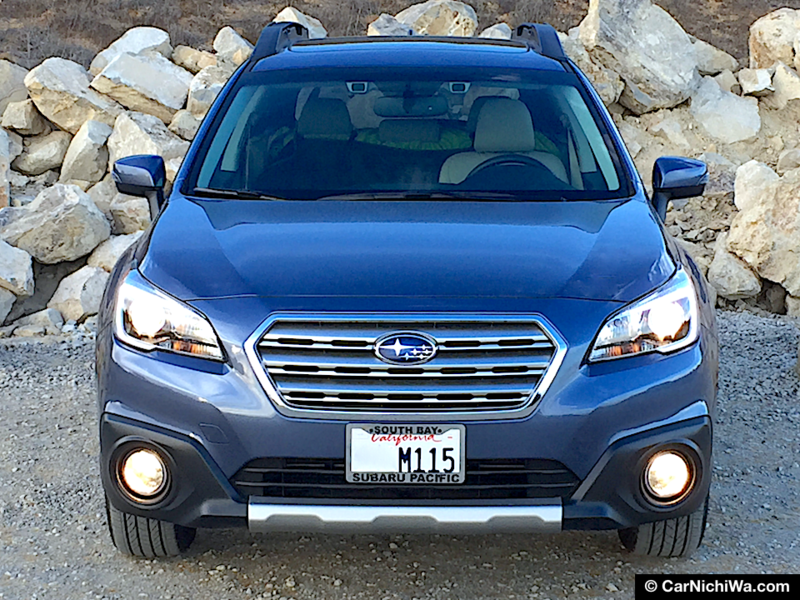 Affordability, ruggedness and “neat on the street” looks appeal to a new generation of owners. Here’s a car we rarely see. This gorgeous 1975 Isuzu 117 Coupe caught our eye with its shapely design from Giugiaro. 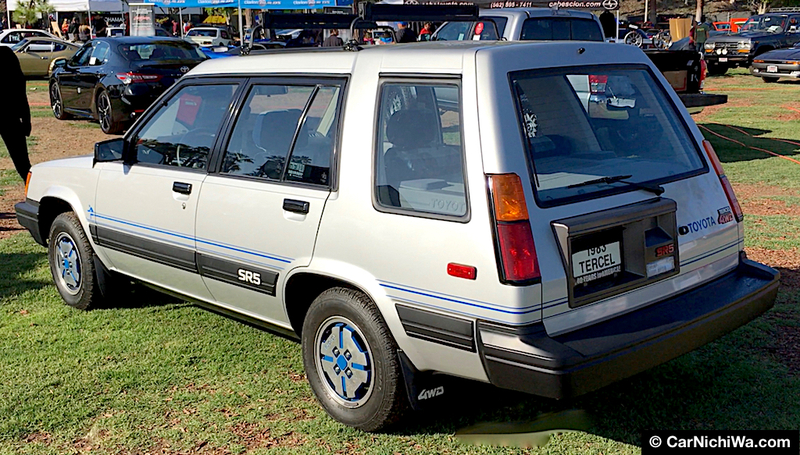 As a testament to its classy looks, this car remains remarkably attractive today. 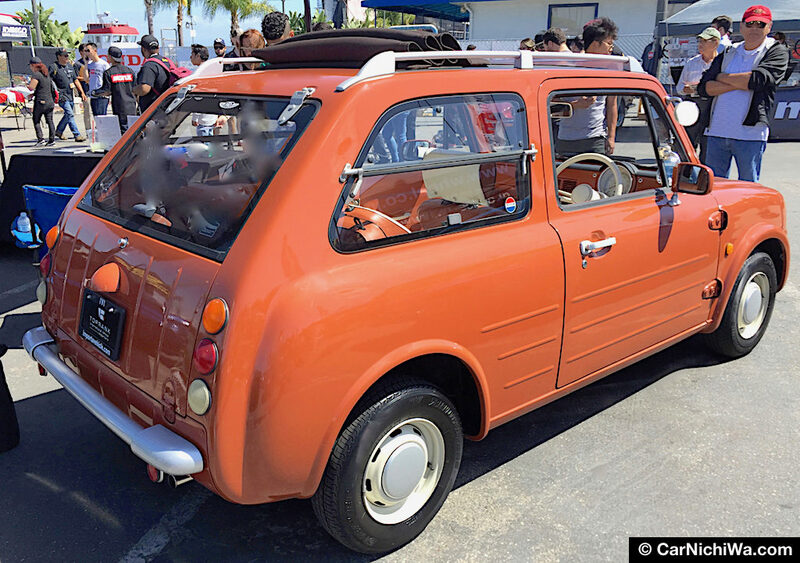 This “Ultimate Subaru 360 Sedan Deluxe” is fully restored by its owner. Be sure to watch our video (above) including a look at the car displayed with period props including a model train. 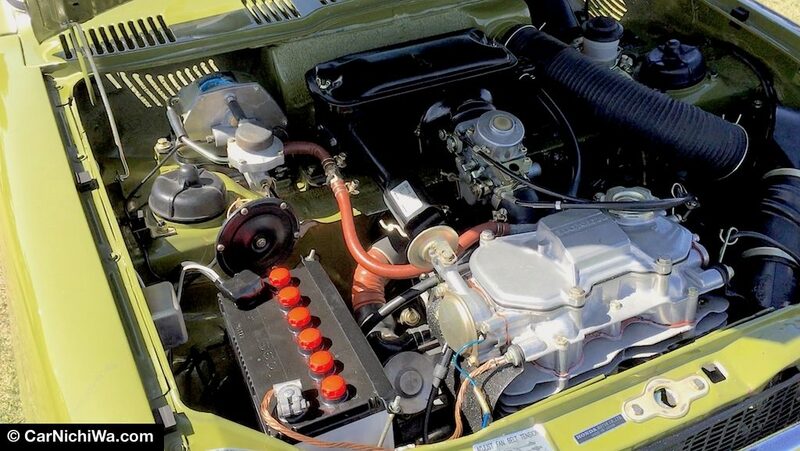 This rare 1971 360 convertible, also called a “yacht,” looks like it came to the show from “Fantasy Island.” While the 356cc 2-cylinder engine puts out just 25 horsepower, its radically modified styling, rarity and cuteness make it a collectible classic. 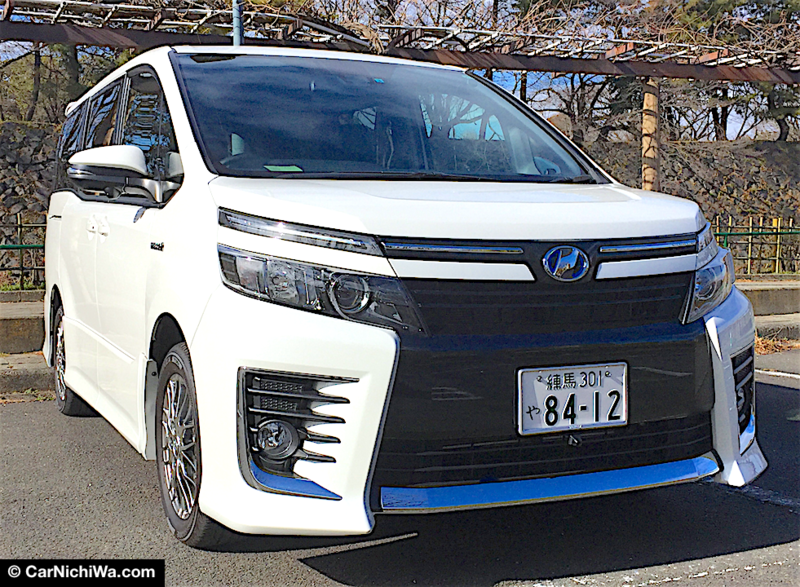 We spotted two examples at the Mitsubishi Delica van at JCCS this year. The white 1985 L300 and gray 1990 Super Exceed are 4WD models powered by turbodiesel engines. This video highlights some of the motorcycles on display at the show, including several examples of the amazing Honda Motocompo from the early 1980s. 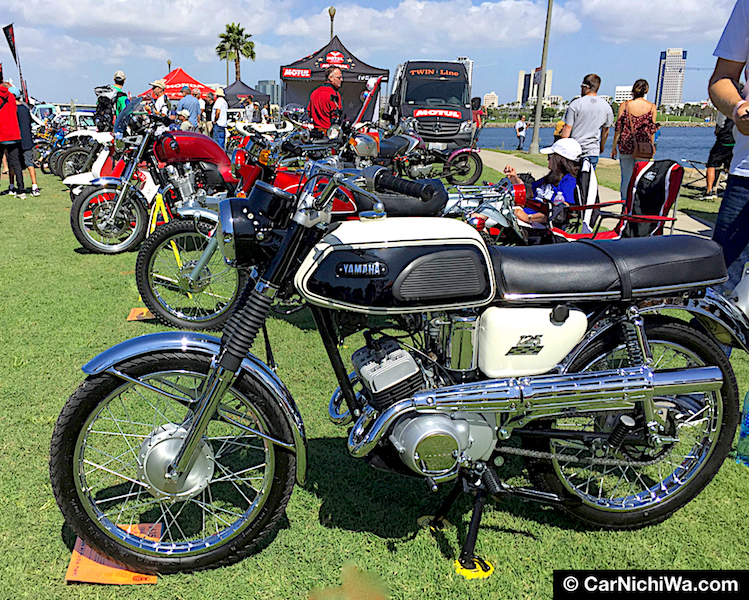 Held concurrently with JCCS, the 7th annual Japanese Vintage Motorcycle Show brought together a field of entries including bikes large and small from Honda, Yamaha, Suzuki and Kawasaki. 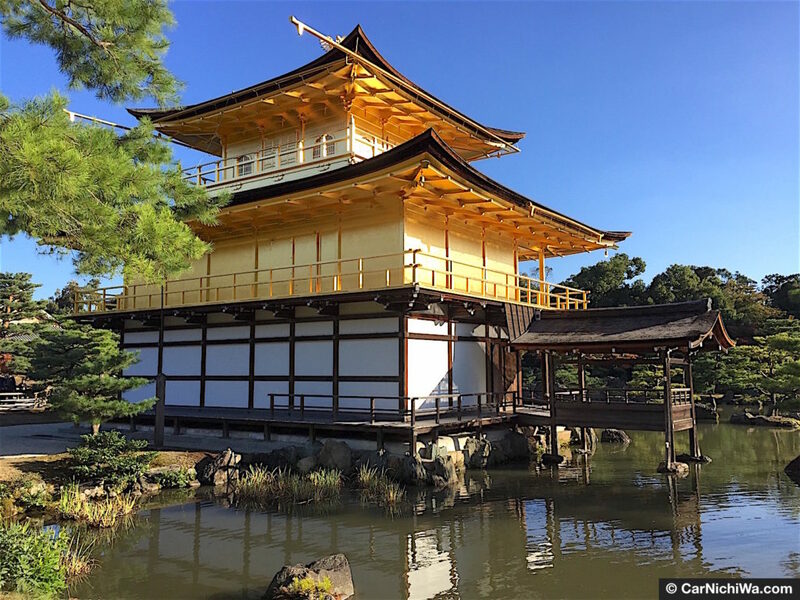 Visit the Japanese Classic Car Show website for more information. Would be cool to see a video of the two mr2s.